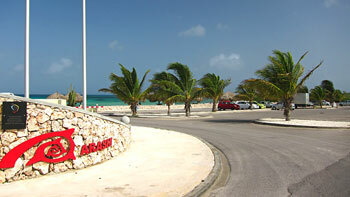 Snorkeling Arashi Beach is the one of the most recommended spots on Aruba. But, unless you know where to swim, you will see nothing but sand and some sea-grass. 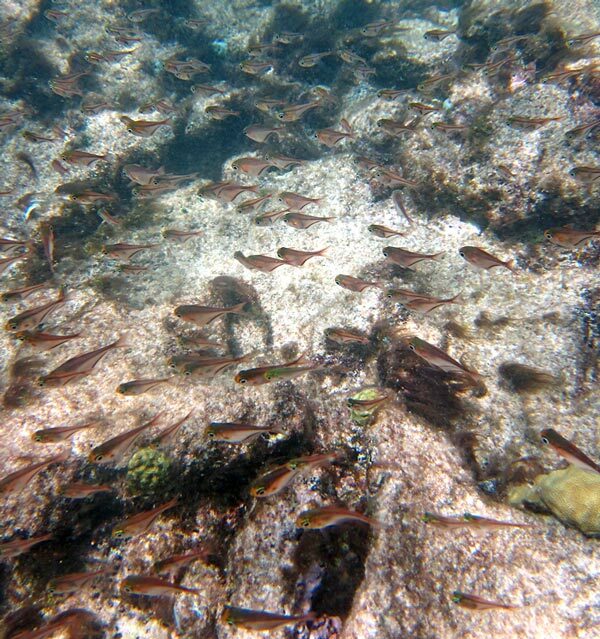 There is some advanced snorkeling on the right end of the beach, and some for everyone on the left end. When we visited there were large fields of floating algae all over, and the dark patches fooled us into thinking there was lots of reef habitat directly in front of the beach. 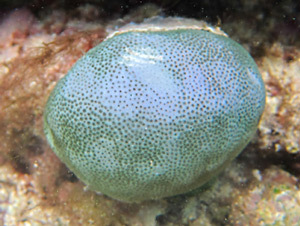 But in fact in front of the beach there is mostly a sandy bottom, with little to see in terms of corals or fish. But at the far right end of the beach there is a shallow rocky area. 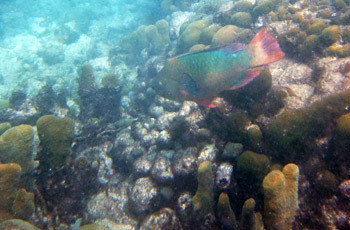 As this extends farther from shore, it turns into a healthy coral reef with some fish. To find this area walk down to the far right end of the beach. Use polarized sunglasses to identify the shallow rocky area. Look out over the rocky area and find the white buoy that is close to where the water turns turquoise again. The corals are close to and inshore of that buoy. You may see them breaking the surface. Snorkeling Arashi Beach to the right, out near these corals, is not really for beginners. It takes a long swim through shallow wavy water. 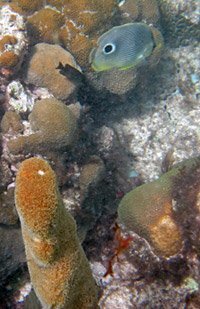 And once you reach the reef, the corals are close together and close to the surface. In that area there tends to be waves, surge and currents, so unless you are experienced, you are likely to damage the coral and yourself. This spot is so near the tip of the island that there is a real potential for strong currents, and more so in the shallow areas. The spot on the left end of Arashi Beach is the same rocky point you access from the right end of Catalina Cove. 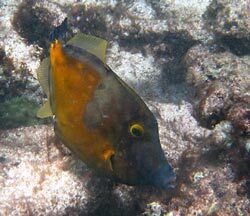 We describe the snorkeling in this area on the Catalina Cove page because we feel it is better accessed from there, although you could do it from the Arashi side as well. Walk along the beach to the right until you see the color of the water get darker. Enter just to the left of the dark area, walking out in the sand until you are in about waist deep water. Then float to put your fins on. Don't walk too far right in front of the dark area to enter because the bottom will be rocky and it stays too shallow to swim for a long ways out. You don't need shoes if you stay out of the dark area on your entrance. Once you have your fins on, start swimming to the right over the dark area. Swim toward the small white buoy and the reef area you sighted from shore. It is near where the water lightens up again. You will be swimming in very shallow water, 2 to 3 feet. Much farther out and slightly to the left there is another buoy, don't swim all the way to that one by mistake. On the shore side of the white buoy is where you will find the corals and fish, the best area for snorkeling Arashi Beach. The reef runs roughly parallel to the shoreline. Fish quantities, while not huge are pretty good. On the reef to the left of the buoy there are huge dead Elkhorn stands with some nice Star Coral. In the center of the reef we found lots of healthy Pillar Corals, and farther to the right some nice stands of healthy Elkhorn Coral, among others. You can weave in and out of the coral field to check it out. 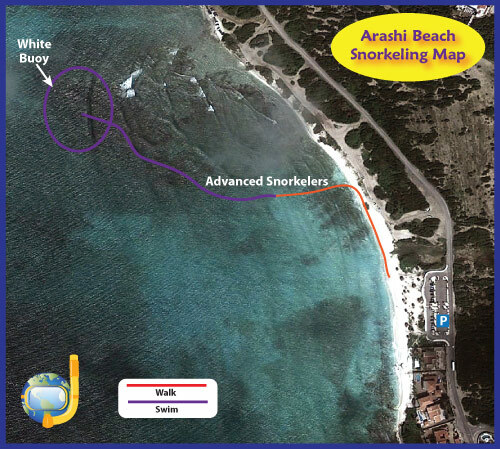 The depths for snorkeling Arashi Beach are very shallow, ranging from 1 to 5 feet. Unfortunately, we experienced poor visibility. The water was full of algae and small pieces of seaweed. Hopefully your experience is better. Stay on the beach side of the white buoy and keep an eye out for boat traffic. Always watch for any currents that are affecting you, and remember to save energy for the return swim. 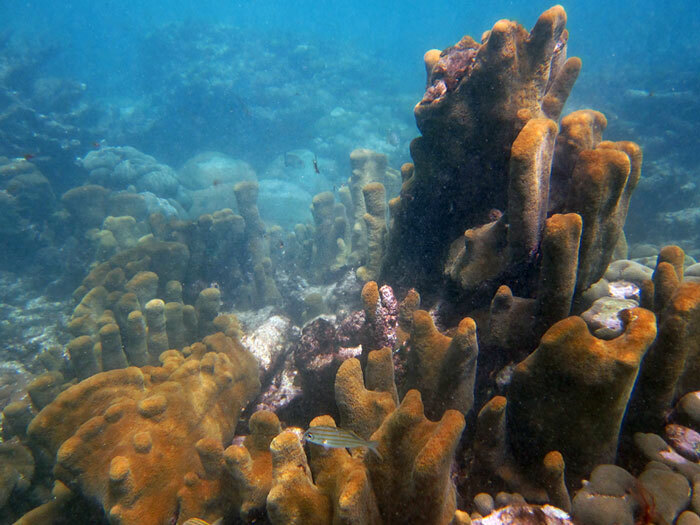 This is a nice reef with a variety of corals, including wonderful Pillar Coral. There were some fish to check out too. Keep going and you will see Arashi Beach parking lot on the left side of the road, there are signs on rock walls at either end of the entrance to the parking lot. On the beach there are shade palapas and chairs for rent. 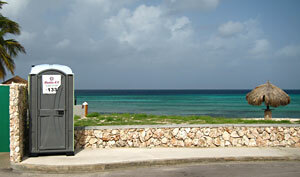 There is a porta-potty and some trash cans in the parking lot.